View More In Scaffolding & Accessories. Remember when you could reach new heights the WEN 1000-pound-capacity rolling industrial scaffolding takes you where no man has gone before. Paint the side of the house. Save a cat out of a tree like a fireman from a dated family drama. Everyone loves firemen. Mount the 29 x 67 inch platform at any of the thirty possible HEIGHT options ranging from 13 inches up to 73 inches with stops every two inches along the way. The platform has a WEIGHT capacity of 1000 evenly distributed pounds to provide maximum support to you and your project. 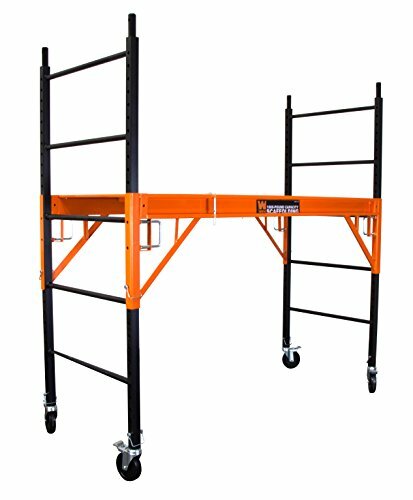 The four swiveling casters include ball bearing construction for a long lifespan along with onboard brakes to stop the scaffolding from moving and scooting in the middle of a job. Mount a second unit on top for a platform over 12 feet high with a combined TOTAL WEIGHT capacity of 1500 pounds. And, because it is a WEN product, the WEN 1000-pound-capacity rolling industrial scaffolding comes backed by a two year warranty, a nationwide network of skilled service technicians and a friendly and helpful customer phone line. Remember when you could reach the unreachable remember WEN. If you have any questions about this product by WEN, contact us by completing and submitting the form below. If you are looking for a specif part number, please include it with your message.